Back pain can be annoying, distracting and, at worst, completely debilitating, so if there’s anything we can do to stop it in its tracks, we will. One way to keep niggles at bay is to ensure a comfortable night’s sleep with a mattress designed specifically to offer targeted spinal support. We've rounded up the best mattresses to beat back pain in this list; whether you prefer a sleep fully supported on a firm mattress or sink in to a memory foam mattress to relieve your achy joints, you'll find something here to suit your preference and your budget. Want to continue to shop around? Check out our pick of the best of the best mattresses. Back pain sufferers often choose a memory foam or latex foam mattress (see our guides for more on these) because they are particularly good for achy shoulders and sore hips. But if you're sharing your bed with a non-back pain sufferer or if you're not a lover of memory foam's sink-in-able qualities, you're going to prefer Button & Sprung's Perendale mattress, which offers targeted spine support no matter which sleeping position you favour. It's incredibly supportive but soft, too. See more below. The first thing to keep in mind when shopping for a pain-relieving mattress is that firm isn’t the same as supportive. In fact, sleeping on a too-firm mattress can put pressure on your spinal cord, or at least prevent sufficient pressure relief from occurring. By contrast, sinking too deeply into a mattress can cause all manner of joint chaos, often resulting in twisted joints and strained muscles. This is why experts generally agree that finding a medium-firm mattress is a good starting point. Of course personal factors, like weight and the way you sleep (side, back, stomach), will also need to be taken into account. But, above all, look for a mattress that will keep your spine nice and straight – or 'aligned' to use the correct term. Use our guide to find out how to choose a mattress to ensure you're fully informed before you buy – especially if you're purchasing online. Our comparison tool will pick the best deals for your preferred mattress below. If you're on the lookout for a mattress deal, whatever its type, we've got the best right here. Upgrading to a new neck-supporting pillow at the same time as you buy your new mattress can be the key to achieving spine-aligned gold – and you should buy them to complement each other. Use our guide to how to choose a pillow to really nail your choice. We've also reviewed the best pillows for the best pillow deals. Who will the Perendale suit? Pocket sprung connoisseurs who don’t want to settle for anything but the best. What is the Perendale like to sleep on? This mattress offers targeted spine support no matter which sleeping position you favour, which is why we have placed it our number one for bad backs. 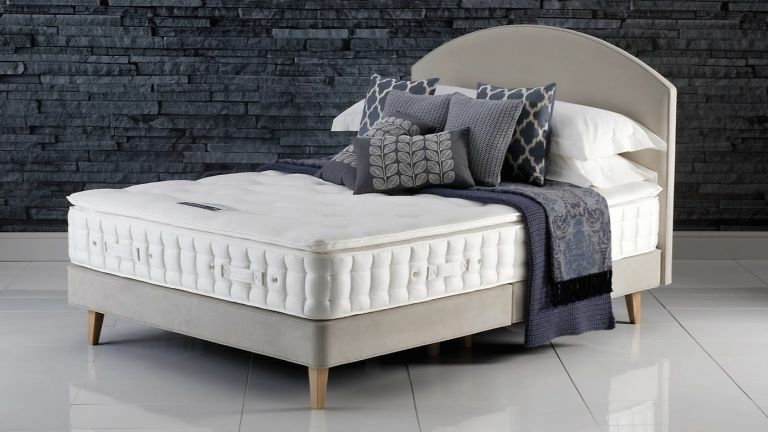 The comfort levels are wonderfully soft, cloud-like in fact, but you might prefer to try the Firmer version if you prefer a solider sleep surface. It’s rated really highly by those who have bought it (reviews from Button & Sprung’s website). Made from 100 per cent natural materials - you won’t suffer any chemically smells from this bad boy. Two layers of natural fillings, one of Egyptian Cotton and Mohair and the other Horsehair, provides the softness, while the springs bring bounce and support. There are 8,000 mini springs (in two layers of 4,000) plus 800 full-size springs in the base. Metal vents in the side help with airflow. A 10-year guarantee, 100-night sleep trial (full refund or try a different model), removal of your old mattress and the packaging, plus £100 off when you purchase a bed and mattress together. Delivery is free within 65 miles of central London. Read our deep review of the Perendale mattress for more information. Who will the Hybrid Plus Raspberry like? Side-sleepers looking for decent support on the hips and shoulders. What is the Hybrid Plus Raspberry like to sleep on? It’s the micro HD springs that give this mattress the extra comfort those suffering from chronic back pain require. Smaller than traditional springs, these micro springs are designed to distribute body weight and reduce the build up of pressure points. There is also a good dose of support, provided courtesy of Hyde & Sleep’s ‘next-gen’ memory foam, which is also specially treated to protect the mattress from dust mites and bacteria. On Hyde & Sleep’s website, the reviews are all top-rate, nearly all 703 reviewers give it the five star treatment. One take-home is that it may take a little getting used to; take time to adjust to the foam/spring combo, especially if you are used to a traditional spring mattress. Made in the UK. Also comes in Medium (called Blueberry) and Very Firm (called Orange). Rotate only (no flipping effort!). Layers of memory foam combined with micro HD springs, all encased in a soft, breathable cover. There are 2,000 micro springs in a king-size mattress. The high-density polyurethane foam base features ventilation channels that provide seven zones of airflow, keeping you cucumber-cool while you sleep. Free delivery to any room, 40-night free sleep trial and 10-year guarantee. Who will the Nostromo Posturepedic suit? Anyone seeking the reassurance of orthopedically focused construction. What is the Nostromo Posturepedic like to sleep on? The name of this mattress, a play on posture and orthopedic, will immediately catch the attention of back pain sufferers, and they won't be disappointed to hear it’s not just a clever marketing ploy. Sealy’s Posturepedic range is endorsed by the Orthopedic Advisory Board. Inside, 1,400 pocket springs work hard to target key pressure points, while a thick latex topper contours to your body shape promising excellent support. Reevoo rates it 8.8 out of 10 (350+ reviews), and which has awarded it a ‘Best Buy’ for four years in a row. Side handles. The silky-soft Tencel cover is anti-microbial and temperature controlling to provide healthy sleeping conditions. Although it’s not designed to be flipped, you will need to rotate regularly and, since this is a solid number, it would be best to ask someone without a bad back to take care of that little job! Latex is the not-so-secret ingredient in this posture-protecting mattress. As well as supporting the spine, latex is naturally hypoallergenic and anti-microbial. The spring base is in two layers, an upper layer for contouring and lower layer to absorb changes in weight distribution, which helps prevent roll-together when sharing a bed. Free next day delivery and five-year guarantee. Like the idea of a hybrid mattress? Read our review of the Sealy Activ Geltex 2200 hybrid mattress. Who will the Casper suit? Everyone, but side-sleepers will really appreciate the targeted support on hips and shoulders. What is the Casper like to sleep on? It’s softer than the other bed-in-a-box memory foams we’ve tried (excluding the hybrid versions with springs that is). This extra ‘give’ is perfect for side sleepers as your hips and shoulders will sink lower than the rest of your torso, providing an ergonomically aligned spine. There’s precious little motion transfer so you won’t notice your partner thrashing about in the small hours. The cooling layers also make it breathable, which again aids undisturbed sleep. Which? has given it five stars for comfort and support, while the majority of Amazon’s reviewers are thrilled with their Casper, revealing that they awake feeling fresh and revived. The top cover zips off for easy cleaning (at 40 degrees in your washing machine, thankfully) and there are handles for easy maneuverability – you’ll be amazed how many mattresses don’t have this simple but extremely useful feature. It comes in eight sizes, including EU (which are a tad longer than UK), so you’re bound to find one to suit. There’s even a Casper bed for your dog! This is a four-layer mattress that is all tucked neatly within a soft cover. The top layer is an open-cell foam that provides immediate bounce and has cooling properties. Next is a high-density memory foam layer, which supports your pressure points. The Transition Layer deals with even weight distribution, and the final layer acts as a supportive base that helps keep everything stable. A 10-year warranty, free delivery and returns, plus very good customer service, according to the reviews. Look out for discount codes on the Casper website and social media – typically around 15 per cent. Read our full tried and tested Casper review for more info and discover our latest Casper deals and offers page. Who will the 3-Zone Memory suit? Anyone seeking no-nonsense targeted support for decent spine alignment. What is the 3-Zone Memory like to sleep on? A dearth of readies doesn’t necessarily equal a poor night’s sleep. This budget option from Silentnight is award winning, namely a Best Buy from Which?. The consumer testing behemoths have decreed that you can expect a well-supported back, and minimal motion transfer (so no painful tweaks when your partner bounces into bed). In fact Which? says, for memory foam, it’s 'one of the best we’ve seen'. Over at Very.co.uk, customers seem similarly smitten, rating this mattress 4.5/5 on quality, value and comfort. Silentnight rates it medium for firmness but, reading many reviews, it appears to be on the softer side of medium in reality. The foam layers are treated with Purotex, which combines five natural bacterias known for their dust mite-busting powers. A soft-knit cover provides extra comfort. The top ‘comfort layer’ is memory foam, and the base layer is Silentnight’s proprietary Miratex foam core, which offers soft support for your shoulders, going firmer for hips and lower back. Just two layers is fairly pared-back compared to modern memory foams and there’s less focus on breathability and airflow so be a little wary if you tend to sleep hot. Free UK delivery, five-year guarantee and a 60-night comfort trial. It’s part of Silentnight’s Mattress Now range, which means it’s wrapped up small enough to pop in the boot of your car should you want to drive to an actual shop to buy one. Read our full review of the Mirapocket Eco Comfort Breathe 2000 (firm) from Silentnight for more info. Who will the Heyford Ortho mattress suit? Traditionalists who enjoy a bit of firm handling. What is the Heyford Ortho like to sleep on? This is a fresh launch from Relyon so there are no reviews yet but you can expect to enjoy the same traditional craftsmanship and superior quality materials for which this UK mattress-maker is renowned. It is designed to offer firm support and excellent posture alignment via a tried-and-tested system of pocket springs, breathable cotton blended comfort layers, and a soft foam top. Three rows of side stitching ensure this mattress won’t collapse like an accordion at the edges. For alternative comfort grades, try the new Barton and Linton mattresses in the same Ortho range. The pocket springs (1,500 in a king-size) are topped with a layer of pure cotton (blended with softer fibres for extra depth) and there’s also a layer of hypo-allergenic flexible foam closest to your body, i.e. where you’ll most benefit from a little bit of yield. Free delivery and up to eight-years' guarantee, depending where purchased. Who will the Ortho Absolute suit? Great for back-sleepers, with or without bad backs. What is the Ortho Absolute like to sleep on? As the name suggests, John Lewis’ Ortho range targets the spine and is a firmer offering for those whose spines need a good straightening out at the end of the day. The online reviews are all favourable, and include a few promising reports of blessed back pain salvation following the purchase of this mattress. Reinforced side-stitched seams ensure this mattress is a keeper. It does need turning but this adds to its longevity – you can expect it to last at least seven years. Made in the UK. Fourteen hundred pocket spring provide the core support in this well-made mattress. On either side, layers of British wool and dual-density polyester bring enough softness to keep joints safely cushioned. The layers are hand-tufted, which basically means you can expect this mattress to last longer, without sagging. Free delivery to a room of your choice and a seven-year guarantee. Who will the Octaspring Tribrid suit? Anyone who has tried all the regular routes to back pain relief without success. What is the Octaspring Tribrid like to sleep on? Uniting memory foam, pocket springs and latex, Dormeo’s top-end Tribrid mattress caters for all. Those with back pain will be particularly relieved to hear about the innovative foam Octaspring layer, which offers five zones of differing strength and density to ensure even pressure relief across the head, shoulders, torso and legs. Not forgetting the all-important latex layer that moulds to the shape of your body, responding to different body weights and shapes with ease. The memory foam and latex combo promises superior motion transfer protection, which is critical when trying to avoid painful bumps in the night. Natural probiotic ingredients injected into the fabric layers help keep allergens and dust mites at bay. Dormeo claims this mattress is eight times more breathable than other memory foams. Combining the three most popular mattress fillings in one, namely memory foam, pocket springs and latex, the Tribrid is designed to deliver the best possible night’s sleep. Each layer works collectively to support and protect the spine. The foam made Octasprings are especially clever for their air-flow encouraging construction, and individual responsiveness. It’s hard to explain how they work, but luckily Dormeo has produced this helpful video.